Who Were the Indo-Europeans and Why Do They Matter? Sol (pronounced like the English word “soul”; Old Norse Sól, “Sun”) and Mani (pronounced “MAH-nee”; Old Norse Máni, “Moon”), are, as their names suggest, the divinities of the sun and the moon, respectively. Sol is female, and Mani male. Sol and Mani form a sister and brother pair. When they first emerged as the cosmos was being created, they didn’t know what their powers were or what their role was in the new world. Then the gods met together and created the different parts of the day and year and the phases of the moon so that Sol and Mani would know where they fit into the great scheme of things. They ride through the sky on horse-drawn chariots. The horses who pull Mani’s chariot are never named, but Sol’s horses are apparently named Árvakr (“Early Riser”) and Alsviðr (“Swift”). They ride “swiftly” because they’re pursued through the sky by the wolves Skoll (“Mockery”) and Hati (“Hate”), who will overtake them when the cosmos descends back into chaos during Ragnarok. The medieval Icelandic historian Snorri Sturluson, whose Prose Edda can’t be taken at face value but nevertheless is in most low-quality introductory books on Norse mythology, offers a story that combines these disparate references into a whole. The story isn’t attested anywhere else, and very well may be an invention of Snorri’s rather than a traditional, pre-Christian tale. According to Snorri, Mundilfari had two children who were so beautiful that he called the girl “Sol” after the sun and the boy “Mani” after the moon. Sun married a man called Glenr (“Opening in the Clouds”). The sun, which had originated as a spark in Muspelheim, was pulled through the sky in a chariot, but the chariot had no driver. The gods were outraged by Mundilfari’s arrogance in the names he chose for his children, so they forced Sol to drive the sun’s chariot. 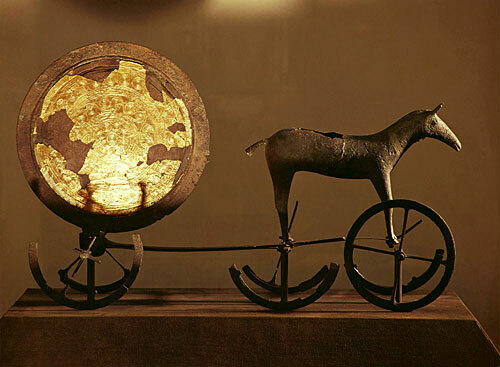 The Trundholm sun chariot from Bronze Age Denmark. 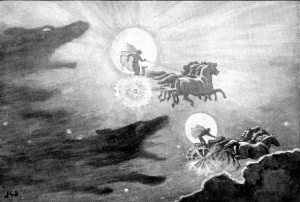 The conception of the sun and the moon riding on chariots through the sky is evidently a very old one among the Norse and other Germanic peoples. It can be found on rock carvings and other Scandinavian artifacts from the Bronze Age, perhaps the most notable of which is the Trundholm sun chariot (pictured). The idea that the sun deity was female, and with a name that means simply “Sun,” is also attested among the continental Germanic peoples. 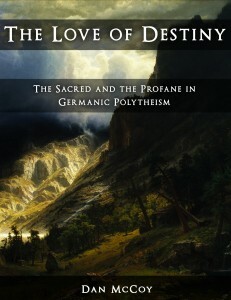 So while we don’t know much about Sol and Mani, we can be sure that the basic conception they indicate is not only authentic, but was a part of pre-Christian Germanic religion from the earliest times. Looking for more great information on Norse mythology and religion? 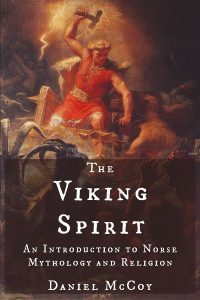 While this site provides the ultimate online introduction to the topic, my book The Viking Spirit provides the ultimate introduction to Norse mythology and religion period. I’ve also written a popular list of The 10 Best Norse Mythology Books, which you’ll probably find helpful in your pursuit. The Poetic Edda. Völuspá, stanzas 5-6. Simek, Rudolf. 1993. Dictionary of Northern Mythology. Translated by Angela Hall. p. 19. The Poetic Edda. Gríminsmál, stanzas 37-39. The Poetic Edda. Vafþrúðnismál, stanza 23. Simek, Rudolf. 1993. Dictionary of Northern Mythology. Translated by Angela Hall. p. 222. Snorri Sturluson. The Prose Edda. Gylfaginning, chapter 10. Simek, Rudolf. 1993. Dictionary of Northern Mythology. Translated by Angela Hall. p. 297. If you've found this site to be helpful, please consider making a secure PayPal donation via the button below. Many thanks! © Daniel McCoy 2012-2019. All rights reserved.